Pretzels - Philadelphia Soft Pretzels, Inc. "the good ones"
'Bretzel' stained glass window in Frieburg's Münster Church. Pretzels aren't just a modern idea, they are a snacking tradition that dates back to the sixth century in Europe. Some say this happened in southern France, some say it was in northern Italy, and others say it was closer to Rome. We will probably not find the exact answer anytime soon, but the story goes as follows. The monks of the time used to prepare bread for Lent, the Christian period of fasting and penitence before Easter. It is said that one monk was disturbed with how much waste happened with the leftover dough. He used the scraps and fashioned a treat that resembled the praying style of the time period, which was placing each hand on the opposite shoulder. This is where the pretzel gets its traditional shape. Monasteries of the early 6th and 7th centuries were centers of learning and religion for the surrounding communities. In order to make use of the new 'pretzel' treat, the monk decided to use them as rewards for children who learned their prayers and lessons. This went over well not just because of the taste, but also the unique shape which interested the local communities. There are two possible root words for pretzel. One is "pretiola" which is a Latin term for "little rewards, little gifts, or little prayers." The other is "brachiola" which is a form of the Latin word "brachia," meaning arms, or "bracellae," which means "little arms." The communities really grew fond of the little treat. So much that the local bakers of the villages started to bake the looped biscuits. They started to flourish around Western civilization and could be found across Europe. Each region gave them its own little 'twist'. The "pretiola" or "brachiola" moved through Austria and finally landed in Germany and became the "brezel," the German equivalent for arm. This then evolved to "bretzel" and finally the recognizable "pretzel." Taking a step into the medieval ages we find the formation of guilds. These guilds helped to establish a control over professions and set prices and standards of practice. The many of the baker's guilds adopted the pretzel for a symbol. There is a legend that is attached to the pretzel bakers' guild of Vienna. In 1529 A.D., the Ottoman Empire of Turkey was sweeping across Europe. They tried to lay siege to the city of Vienna and take its walls. For three weeks their attempts failed, causing them to try a new approach. This approach was to tunnel under the city walls. To keep this effort hidden, the Turkish soldiers worked at night to dig and remove the dirt. Unknown to the troops, the pretzel bakers were awake and baking their product to sell the next day on the streets. The bakers heard strange noises in their cellars. Discovering this to be the invading army, they alerted the city, armed themselves, and charged into the tunnels. The Turks were defeated and turned away, and Vienna still stood! During another battle, the invaders tore a cross from the top of St. Stephen's Church and replaced it with the crescent moon flag of the Turkish empire. A group of pretzel bakers climbed up the church, tore down the banner, and replaced it with the cross. The brave and courageous actions during the siege led to the Emperor of Austria bestowing an honorary coat of arms upon the pretzel bakers. There is a crown at the top of the crest to signify the royal gift. A lion is below the crown and symbolizes bakers' courage. Lastly, a large shield emblazoned with the form of a pretzel represents the tough battle that was fought. This coat of arms is still used today in many pretzel bakeries to honor those original bakers. Fast forward a century or so and we find the pretzel being brought to the early American colonies. The Germans and Austrians enjoyed their "bretzels" so much that it was certain the immigrants coming from these countries would bring the delicious treat with them. The Pennsylvania Dutch were those immigrants and they had brought various recipes, special doughs, and the fine art of twisting the pretzels. Over the decades the pretzel has spread across the country so that almost everyone has seen a pretzel or has heard of them. In the northeast region of the country, specifically Philadelphia, the pretzel has become a daily staple in the diet of children and adults alike. 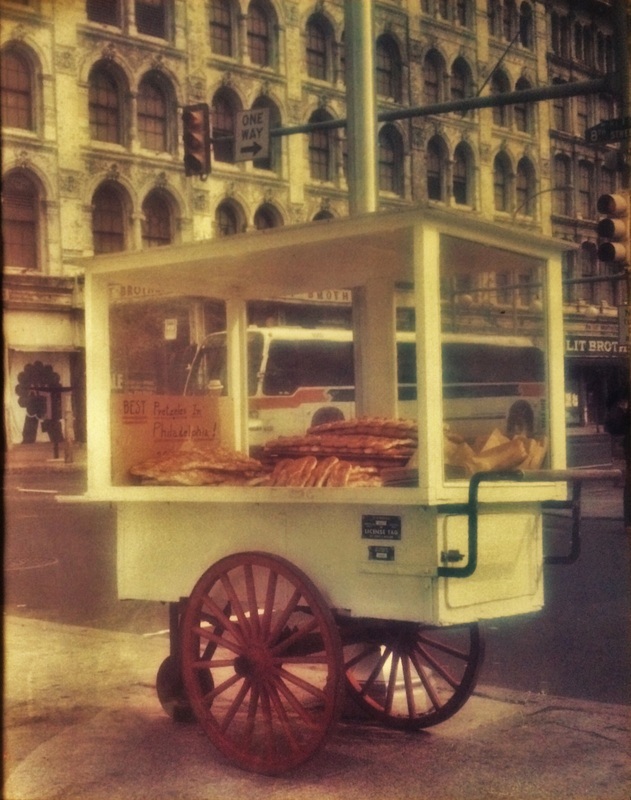 In the Philadelphia Evening Bulletin in 1965, James Smart had stated, "The Pennsylvania Dutch may have brought the pretzel here...but it was Philadelphia who civilized it and made it into a household pet...Every street corner of any importance in Philadelphia has its own resident pretzel vendor." ~Phyllis R. Emert. The Pretzel Book. New Hope, PA: Woodsong Graphics, Inc., 1984.